Jamaican track and field sprinter who broke world records in the 100 meter race, winning gold in the event in 2008 in Beijing and 2012 in London, as well as bronze at the 2016 Olympics in Rio. She was a virtual unknown before exploding onto the Olympic sprinting scene in the 2008 Olympics. She became the first Caribbean woman to win Olympic gold after winning the 100 meter event at the 2008 Olympics. She became the first woman in history to win 100 meter medals at three consecutive Olympics. She married Jason Pryce in January of 2011. They welcomed their first child, a son named Zyon, in August 2017. 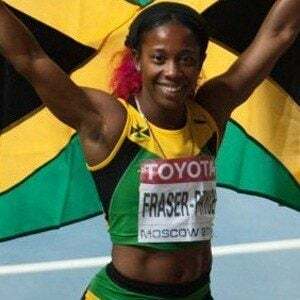 She was teammates with fellow Jamaican runner Asafa Powell at the Olympics.